It's time to tackle two falsehoods: 1. Muscadet is simple swill. 2. Artichokes and wine don't pair well. I'm here to tell you that Muscadet is lovely and you can pair anything with wine if you smother it in cheese first! 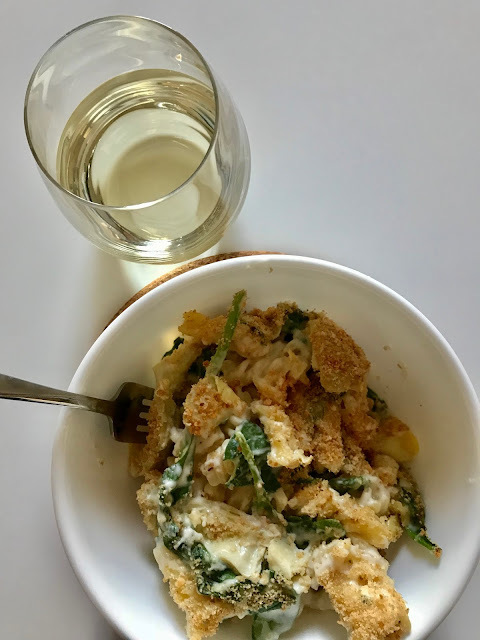 Spinach-artichoke macaroni and cheese paired with a glass of Muscadet. Back in the '80s Muscadet was one of the most popular wines on the block, but during the '90s it suffered due to lower quality wine making and the rise of different varietals. Over the past few years, a number of sources have called for its resurgence, and with good reason! A great bottle of Muscadet is everything you're looking for in a white wine: crisp, clean, multidimensional, and affordable. It is a still wine, but like traditional method sparkling wine, Muscadet ages on its lees ("sur lie"). Lees give it a slightly yeasty taste, as well as its signature tingly, creamy mouthfeel. 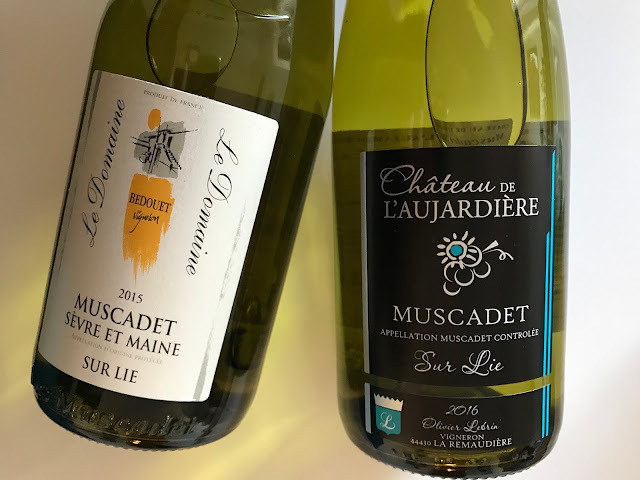 As for cost, I easily found three bottles under $20: Domaine de la Fruitiere Muscadet Gneiss de Bel Abord, Bedouet Vigneron Muscadet Sevre et Maine Sur Lie, and Olivier Lebrin Chateau de L'Aujardiere Muscadet Sur Lie Loire Valley. Muscadet is one of my favorite white wines. "If it grows together, it goes together": Thanks to its proximity to the Bay of Biscay, Muscadet is traditionally paired with oysters. Muscadet and bivalves are what wine people call a "perfect pairing" because quality Muscadet sometimes hints at briny seawater. But since I'm shifting from pescetarian to vegetarian, I paired it with its favorite cheeses: Gouda and Gruyere. 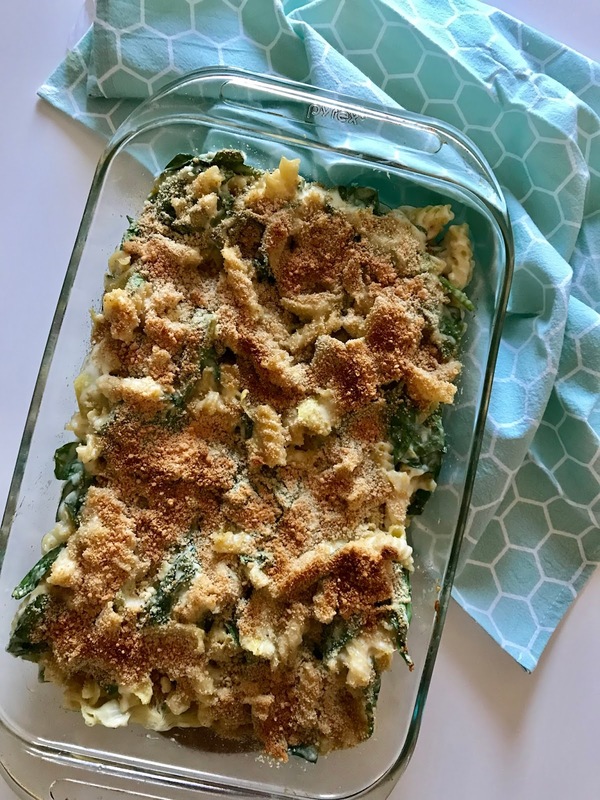 To provide a little bit of texture and nutrients, I used The Kitchn's recipe for Spinach-Artichoke Macaroni and Cheese. 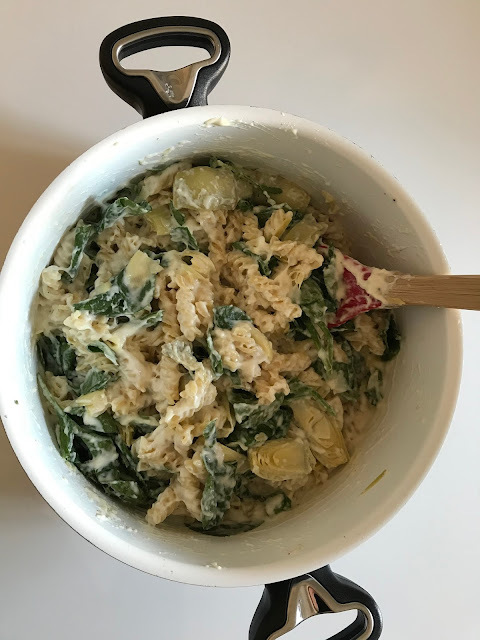 The Muscadet's high acidity and tingle cut through the creamy Gouda and Gruyere, and its lemon zing paired nicely with the artichoke. I replaced the panko breadcrumbs with regular and used 2% milk instead of whole. It took me 50 minutes from start to finish—pretty fast for fancy mac and cheese! One-pot wonder mixed up and ready for the oven. Glowing bread crumbs and Parmesan after a quick broil. Let me know if you have a favorite Muscadet and food pairing! Hello, fellow oenophiles! 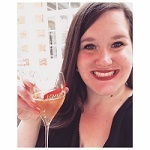 I'm Meg, a blogger in constant pursuit of new, wallet-friendly wine experiences. Join me as I swirl, sniff, and sip my way through the world of good value vino! Disclaimer: Meg & Merlot is a participant in the Amazon Services LLC Associates Program, an affiliate advertising program designed to provide a means for sites to earn fees by linking to Amazon.com and affiliated sites.